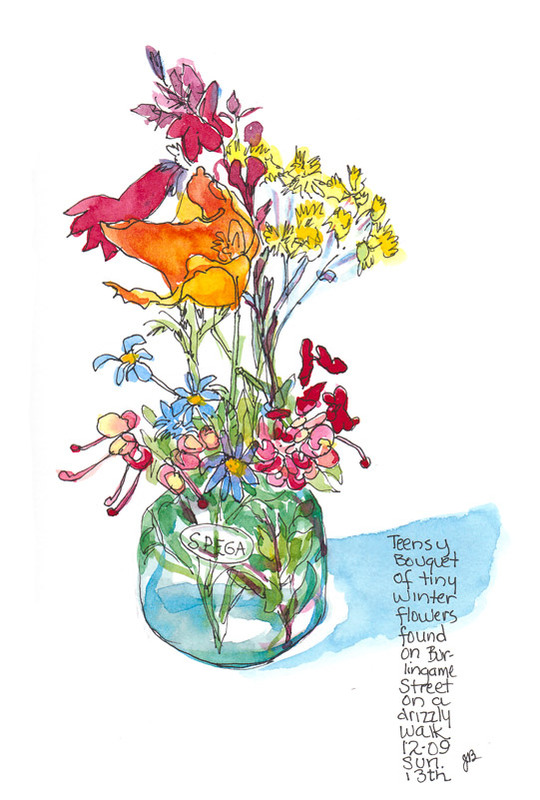 Tiny Bouquet, ink and watercolor, 9x6"
I was surprised to find a variety of colorful teensy flowers growing along the sidewalks on my walk this afternoon in the cool misty weather. It felt so great to be out walking without the icy cold and then pouring rain of the past week and the bright colors were a great bonus. I felt a little sheepish about picking flowers that didn’t belong to me, but the they were so tiny and since I only took a sprig or two a few inches in length I didn’t think anyone would mind. Some might even have been volunteers (aka weeds?). When I got home I stuck them in this little glass container some pricey French yogurt had come in (that I bought for the container). Then I got back to working on my website. When I’d finished it was bedtime but I knew these flowers probably wouldn’t last until tomorrow. And I really needed a little fun so I put on a CD and so enjoyed drawing them and painting them. If you’d like to take a look at my rebuilt website, I’d love your feedback. Although it’s now cleaner and easier to update, I’m disappointed in a couple of features that really bug me. I’ll either get over my perfectionism or sometime later I’ll rebuild it again. The problem with technology is that by the time you’ve researched the best gizmo, bought it and learned to use it, it’s already obsolete. Aren’t you glad that not everything in life is like that? What pretty flowers and such a clean little painting. The unexpected things that we meet each day provide a great source for picture-making. Better to live an unplanned life I think. Whilst picking “wild” flowers may be frowned on in some corners Jana, seeing them transformed into such delightful images more than makes up for that transgression. There is almost a sense of birds frolicking amongst the bouquet in your drawing. I think the website works quite well, though as you no doubt know, you can keep trying to perfect it forever and still find perfection eludes you. As for technology – I look at it in the same way as I do relationships, they appear to continually mutate, but when you look beneath the surface, not a lot has really changed. That is why I enjoy them both (and why they also frustrate me). It is also why art is so much fun; just when I think I have it sorted, a completely new perspective ambushes me. I so agree with Wendy about greeting the unexpected things, each day, in our lives. Such a happy bouquet. I hate to admit that I never took in that you had a website, so I had a delightful visit there. I don’t think I have ever seen the trees at El Cerrito or Tilden Park, which I really liked,, and the landscape of Rush Rance just blew me away. I was impressed with your new website. I enjoyed it very much. Oh, I really love this one… so delicate with the pen and ink and touches of color… you really captured the sweetness of the little bouquet… I love simplicity on a page. What a beautiful little painting. Charming! Jana, I’m curious what tpe of setup you have when you go to sketch and add in watercolors. I really like your style. I just wonder how you go about it. What you take with you for example, when you were sketching in the market. Did you add the watercolors while you were there? I’ve just picked back up my brush, and I have to say, seeing your artwork, really inspires me to try some different things.